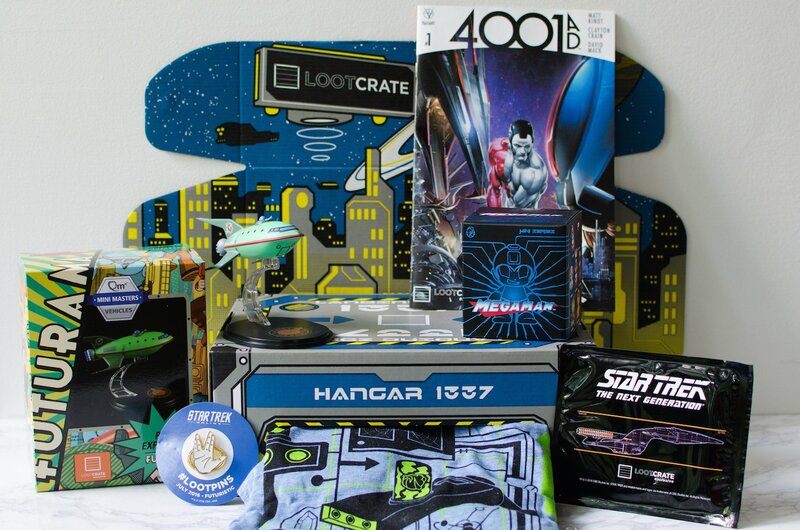 Loot Crate is a monthly subscription box for geeks and gamers. Each month they include themed collectibles and shirts – lately, they’ve moved towards a mostly exclusive model – so you can’t get most of these items anywhere else! Loot Crate kindly sent us this box to review. (Check out the review process post to learn more about how we review boxes). The Products: 6-8 epic products curated around a geeky theme. Keep track of your subscriptions – add Loot Crate to your Subscription List or Wish List! Check out all of my Loot Crate reviews and make sure to add Loot Crate to your subscription list or wishlist! Loot Crate’s theme this month was Futuristic! How great is the box design this month?! Each month comes with a mini-magazine. The magazine has more details on each item included, interviews, and other fun stuff to read. Each month also comes with a themed pin – this month is Star Trek themed with the ‘Live Long and Prosper’ gesture! Your pin also scores you digital loot each month. This month’s pin gets you a free Starfleet Admiral’s Commission Pack ($50 Value) for the online free-to-play Star Trek Online. Rick and Morty Portal Gun Shirt – Value $15? We brave the sweltering heat to grab a shot of this amazing shirt (Buckles was pretty jealous to not be held in the shot)! This is my favorite shirt to-date. I’ve received a couple Rick and Morty shirts that feature them – but I’m more of a subtle geeky shirt fan, and this one is perfect for me. Planet Express Q-Fig – Value $20-25? having recently bought most of the current line of Q-Figs, I can attest that they’re a little more pricey than a POP, so I’ve estimating accordingly on value for this exclusive. How cool is this Planet Express model! I love Futurama (who doesn’t?) so this was immediately added to the collection. The detail and paint are spot-on for this vinyl figure. 3″ Mega Man Red Variant Figure – Value $15? This is a Loot Crate exclusive variant color. This comes at a perfect time as we’re now hearing rumors of a new Mega Man game for current-gen consoles, along with an upcoming animated series – awesome! Star Trek Dedication Plaque Replica Decal – Value $5-10? This replica from the U.S.S. Enterprise is an attachable sticker/decal that is three dimensional. It’s like a little bubble, essentially. The final item is 4001 AD #1 from Valiant Comics. This is also a Loot Crate variant cover. I’ve been read a bit more valiant comics since last month’s Comic Bento was a Valiant featured month. We didn’t receive 4001 AD in that shipment, so I’ll be adding this to my pile. Verdict: This month’s Loot Crate was a massive win for me! I had a good feeling this month since it featured two of my favorite franchises in Futurama and Rick and Morty, and neither of those items disappointed. Those two items alone make this crate awesome, and above value for me. I could see a lot of disappointment if you don’t like those franchises, though. What did you think of Loot Crate “Futuristic”? Is the coupon SAVE3 for just one month or is it for every month? I canceled this month. We moved to a different state in June, I changed my address before the box shipped, but they sent June and July to the wrong address. I contacted customer service and the email I received told me I ‘skipped’ too late, so that was why it was sent wrong. I never skipped anything and didn’t appreciate the blame being shifted to me. I double checked my account before I contacted them and my new address is on my account as pretty as you please. They’ve been lackluster lately anyway. Any suggestions on better geek boxes? My 14 year old and I share the contents every month. I buy this Mega Man mysteryboxes, as his my all time favorit, and have got 2 of the red ones. The box also says that the red is 1/20, so I think Loot Crate are doing a tricky one here and says that they are Loot Crate exclusive colors. Or is the red more red then the regular one? You could be right – I just double-checked the mini magazine, but it makes no reference of 1 in 20 or anything, just states that the colors are exclusive. I’d describe my red as being more orange-ish – but I really don’t know if it’s any different from the 2 in your collection. Yeah my red is also more orange-ish. Check the side of the box that the figure was inside, not the loot crate box the smaller one, there you should see the 1 in 20 thing i talking about. Btw i trust you in the thing you are saying regarding the mini magazine. Maybe its Loot Crate exclusive that everyone gets the red and you don’t have to buy box after box to find it by yourself? It does say 1/20 on the box – I know all subscribers got red, so I’m sure that’s the exclusivity about it. My fiancé and I haven’t been excited for many Loot Crates this year, we only got the one with the labyrinth shirt. It’s because they’re not putting pops in them and the other stuff hasn’t been that great. But we love the Marvel and DC boxes from Funko! We’ve even bought double boxes two times and might have to do it again depending on what the next DC box has. Loot Crate is on Groupon right now. $13.95 for one month shipping included. I HOPE the mega man rumors are true! It was one of my favorite games as a kid!